Owned and managed by the by Interisland Resort and Services, Inc., a French-Filipino management, Red Coconut is strategically situated on the White Beach at a popular place right in the center of the island where the most sought after facilities, restaurant, bars, discos, and boutiques are found right in the midst of action. Red Coconut Beach Resort has 20 rooms including 16 executive air-conditioned rooms that can be converted into fan-cooled rooms, 3 fan-cooled rooms and one family cottage. The resort is made up of native style cottages located in the tropical garden setting. Each cottage has its own verandah, tiled bathrooms with hot and cold showers. All the executive rooms are equipped with telephones, intercoms, cable TVs and mini bars. There are stand-by generators in case of power failure. The Red Coconut Restaurant provides sumptuous meals and hearty cocktails besides grilled seafood, barbeque and international cuisine against the spectacular background of sunsets. All the beach and water sports facilities such as boat ride, fishing, horse back riding, bicycle and motorcycle rental, water sports facilities like snorkeling, jet skiing, banana boat ride, wind surfing and scuba diving are available close by. The resort also offers travel services like flights and hotel confirmation, passport and visa processing, island tours and other domestic tour arrangements. Alyssa Boracay Resort, a small island resort over grown with palm trees, is situated off coast of Aklan in the Western Visayas in the southern part of the 3.4-kilometer stretch of white sand beach. It is just close to the best snorkeling and swimming areas and the Filipino, Italian, Thai, Swiss and German restaurants which make the stay of the foreign guests more convenient. The resort offers three types of accommodation to fit in the needs and budgets of the guests with all the comforts of the modern day resorts. There are facilities for island tours, diving, windsurfing, jetskiing, snorkelling, mountain bikes, motor bikes and sailboats. Calypso Diving Resort, with its tropical and romantic ambience, is a small six modern beachfront room resort that delivers great value right on the white sand beach. 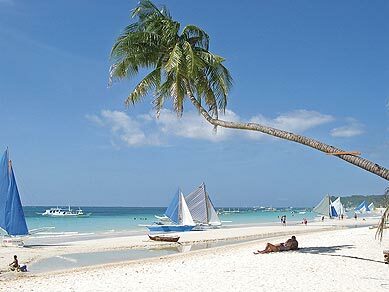 The resort is centrally located along Boracay's three kilometer white beach and boat station. It is quite close to the tourist center, Talipapa flea market and also 5 minutes away from the main road where public transport is easily available. It is a haven both for divers and non-divers. It has a rich restaurant bar and a 5- star PADI Dive School. The resort is surrounded by a 2,000 sq. meter garden. There is a swimming pool with the rooms directly behind it. The first class facilities at extremely competitive prices attract the customers to come here again and again. The rooms are air-conditioned with attached bathrooms and 24-hour hot and cold water supply, mini bars and cable TVs. The guests can relax by the poolside at the Wreck Bar and Restaurant for an ice cold drink and a sumptuous meal after day long 'hard day work' of grueling diving. The resort has a diving school, bar and restaurant, ticket confirmation facility, telephone with IDD and safety deposit box.